Dakota Lithium batteries are built to be modular and easy to use. All of our 12 volt batteries can be connected in series or parallel to provide more volts or more capacity (read the how to article here). For example, to run a 24 volt trolling motor you can connect two 12 volt batteries in series. Or to run a 48 volt electric car you would connect 4 Dakota Lithium 170Ah batteries in series. What can my battery power? Below is a breakdown of how many times a Dakota Lithium battery can recharge your personal electronics, remote workstations, and outdoor adventures. Results may vary with different products. These are the products used for testing: Smartphone: iPhone X, Headlamp: Foxelli MX10, POV Camera: GoPro Hero 7 black, Tablet: iPad 9.7″, Laptop: Surface Pro 6, 12v Trolling Motor: Newport Vessels 12v 36lb Thrust Trolling Motor, Fish finder: Vexilar FLX-28. Here at Dakota Lithium we believe quality matters. And that quality is measured by the lifespan of a battery. 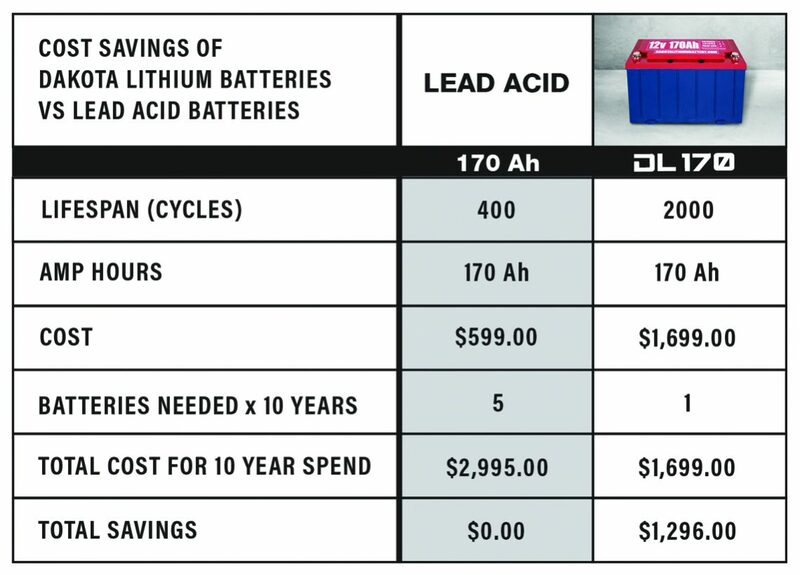 That’s why we built the longest lasting lithium batteries on the market. To help you do what you love longer. And to provide you with the best lifetime value.